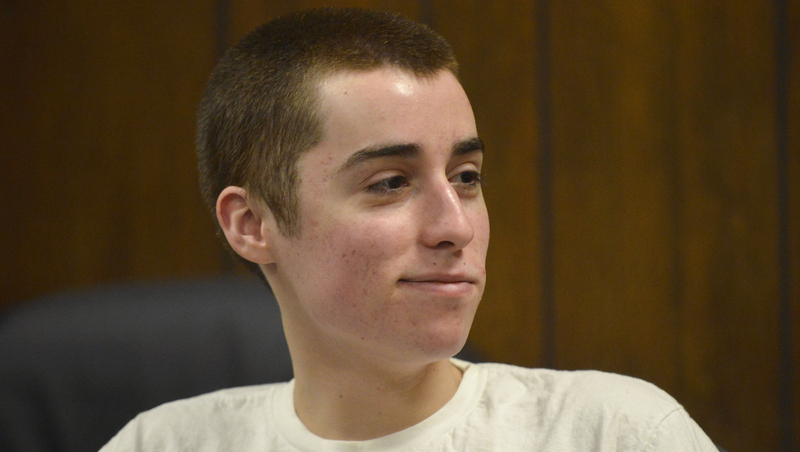 T.J. Lane - the teen who killed three students at a Chardon, Ohio high school in 2012 and who infamously wore a T-shirt scrawled with the word "killer" to his sentencing hearing - escaped Thursday night from a prison where he was serving three life sentences. He was caught nearly six hours later, but his escape sent authorities scrambling and left many wondering: how could it have happened? Authorities say the 19-year-old killer and two other inmates were outside for recreation when they climbed over a fence to flee the Allen Oakwood Correctional Institution, a minimum- and medium-security prison in Lima about 80 miles south of Toledo. Following the escape, police officers were sent to guard the homes of the families of Lane's victims and Chardon school officials decided to cancel classes Friday. Nearly six hours after his escape, at 1:20 a.m. Friday, Lane was caught by two state troopers about 100 yards from the prison. A second prisoner had been caught almost immediately after the Thursday night escape, and the third was apprehended hours after Lane. Authorities haven't said how their escape was made possible - but Richard Lichten, a retired law enforcement official and an expert in police and jail procedures, tells 48 Hours' Crimesider prison escapes are usually attributed to human failure, mechanical failure, or sometimes both. According to Lichten, a lengthy investigation will undoubtedly take place to determine how the inmates were able to escape and ensure it doesn't happen again. He says the investigation will focus on the policies and procedures at the prison and will also look to see whether there was some sort of security mechanism failure. "How were they able to scale this fence? Was there barbed wire? Razor wire? Alarms? If so, how were they able to defeat that?," Lichten asked. "Did these three have help from the outside? Was this a plan?" In this case, Lichten notes, it's possible the three escapees were misclassified and should have been housed in a maximum security prison. Inmates are classified based on a variety of factors, including the sophistication of the crime they committed, their criminal history, their education level and whether the inmate is well-known, powerful or has any ties to gangs. "Typically the courts will sentence a person to "X" amount of time and then it's up to the prison system to determine where this individual will be housed," says Lichten. Daniel Kennedy, a professor of criminal justice at Oakland University in Michigan, says it seems like Lane may have been misclassified - and possibly due to his young age. "He should have been at a maximum security facility. Three murders, three consecutive life sentences... who wouldn't try to escape?" Kennedy told Crimesider. Kennedy says that while he hasn't seen the fence at the Allen Oakwood Correctional Institution, in order for the fence to be effective, he says it should have had sensors on it. He also says there should have been "a double fence" with barbed wire on top and razor wire in between the two fences. While maximum-security prisons have very firm perimeters, minimum-security prisons are known to have "light fencing where folks can almost walk away, and often do," says Kennedy. Lane was housed on a "protective control" unit at the prison, a higher security setting than the main compound, according to a legislative prisons oversight committee statement Friday. An April inspection by the committee noted ongoing security concerns at the unit. Security management "remains a concern, both in terms of how the higher security inmates are handled, as well as discipline for misconduct," a May report by the Correctional Institution Inspection Committee says. The Ohio Civil Service Employees Association, the union representing Ohio prison guards, said Friday that prison officials were warned about an escape on Wednesday. One inmate was put in segregation when the plan was discovered. That inmate was housed in the same unit as the three who escaped on Thursday, and prison officials didn't take additional steps to secure the unit, the union said. According to CBS affiliate WOIO, in April 2014, an inspection found that the Allenwood Correction Institution was at a 115 percent capacity rate, something Lichten says could have been a factor in Thursday night's escape. "When jails are overcrowded staffing is an issue, security is an issue," Lichten says. According to Lichten, if the investigation into the escape finds any of the prison administrators were at fault, they will be held responsible. Kennedy agrees, saying, "...Heads will roll if there were violations of procedures and rules by corrections personnel." But in the meantime, Lane and the other two escapees are likely to be charged with escape and receive more prison time than they had to begin with, Lichten says. In the aftermath of the escape, Lichten also notes that it's important for the three to be separated from each other, placed in solitary confinement and have their security level raised immediately. At first glance, while it might be easy for the public to point the finger at the prison and question what they did wrong, Lichten says that even at the best run jails and prisons, "sometimes things happen." "Inmates only have one thing to do all day long," he says. "And that's think about how to get out."